Eating clean is a dirty, dirty business. Eating clean isn’t a formula. It’s not merely calories in and calories out. It’s not just the nutrition label. 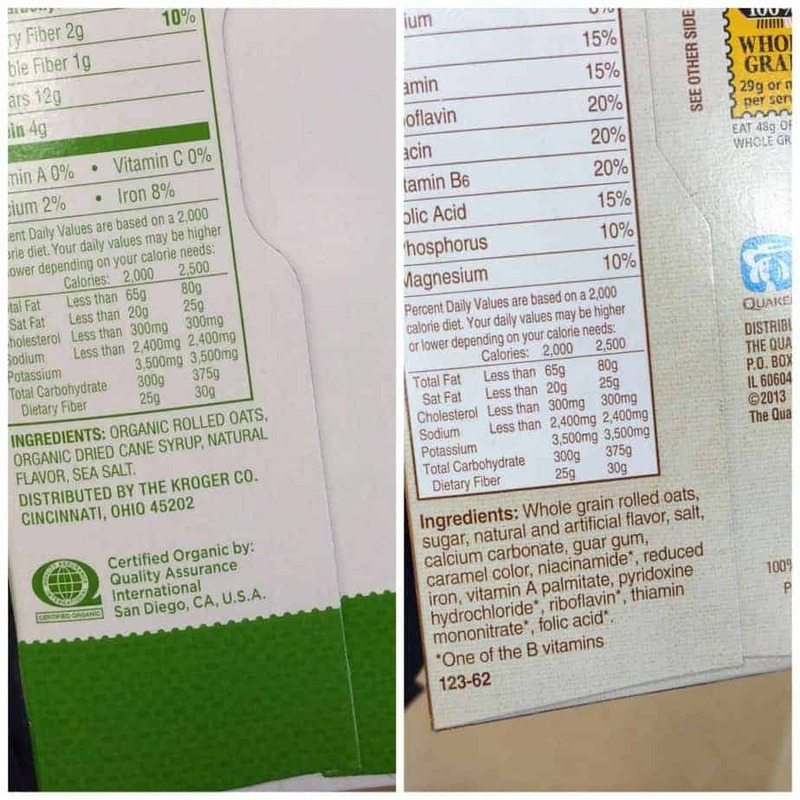 It’s not skim milk, light “wheat” bread and Fiber One cereal tainted with aspartame. 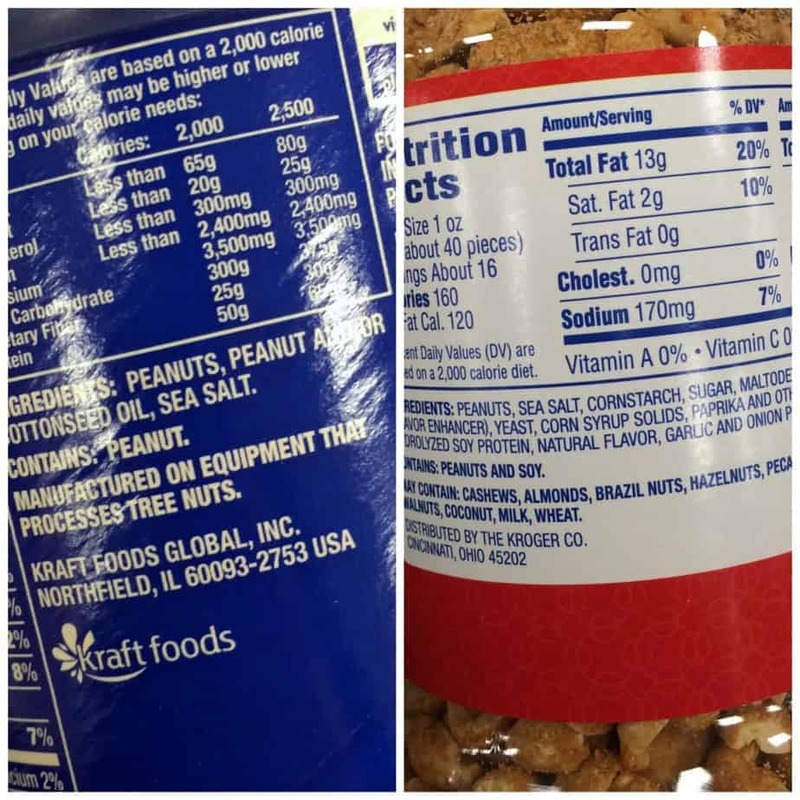 It’s not reduced-fat peanut butter solidified with trans fat and it most definitely is not cheese whiz from a can made with “real” cheese. Ummm? I can’t even. Let me be frank here. I firmly believe that the quality of the calories we consume is just as critical (if not more) than the quantity. Though we’re different metabolically, we’re all still fueled by the energy we get from the calories in our food. And is it food that we’re really eating or merely a food product? I’m not so sure. It’s up to us to give our bodies real food with real inherent nutrients. Easier said than done, right? That doesn’t mean high fiber oatmeal pumped up with added oat fiber or high protein granola tainted with soy protein isolate. Nothankyewww. Allow me to step on my soap box for a hot minute. Protein is a macronutrient found naturally in meat, dairy, eggs, beans, nuts, legumes and soy. Appreciate granola for the carbohydrate that it is and the protein that it isn’t. Must we inject EVERYTHING with protein and fiber? The high-protein cream cheese stunt just about did it for me. Enough already! Eat foods made of plants, not in them. Eat foods with ingredient labels shorter than my hair. Get out your microscopes and get comfy. Step into my office (or brain) and allow me to mentally walk you through the conundrum that is the grocery store. Watch me as I pick up a product (and probably put it right back down) as I look first and foremost at the list of ingredients. For the sake of brevity, I’m not going to write a novel about why every ingredient is specifically detrimental to the diet. I merely want to provide you with a quick snapshot of how to make the cleanest decision when grocery shopping for your favorites. I chose to take these pictures at Kroger (as opposed to Whole Foods or Trader Joe’s) for a realistic snapshot of the good and the evil out there. 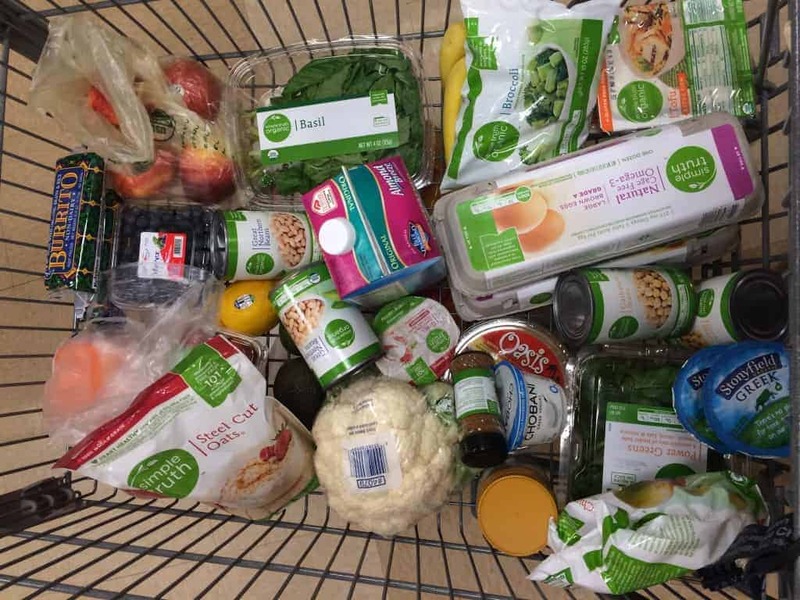 Some of the “good” versions happen to be Simple Truth, which is Kroger’s affordable, healthy house brand. Though I’ve done work for Simple Truth in the past, I am in no way being compensated by Simple Truth for this post. They just happen to have awesome versions of several products. This is all me, folks. When it comes to yogurt, aim for simply milk and bacteria (acidophilus, bifidus, etc). 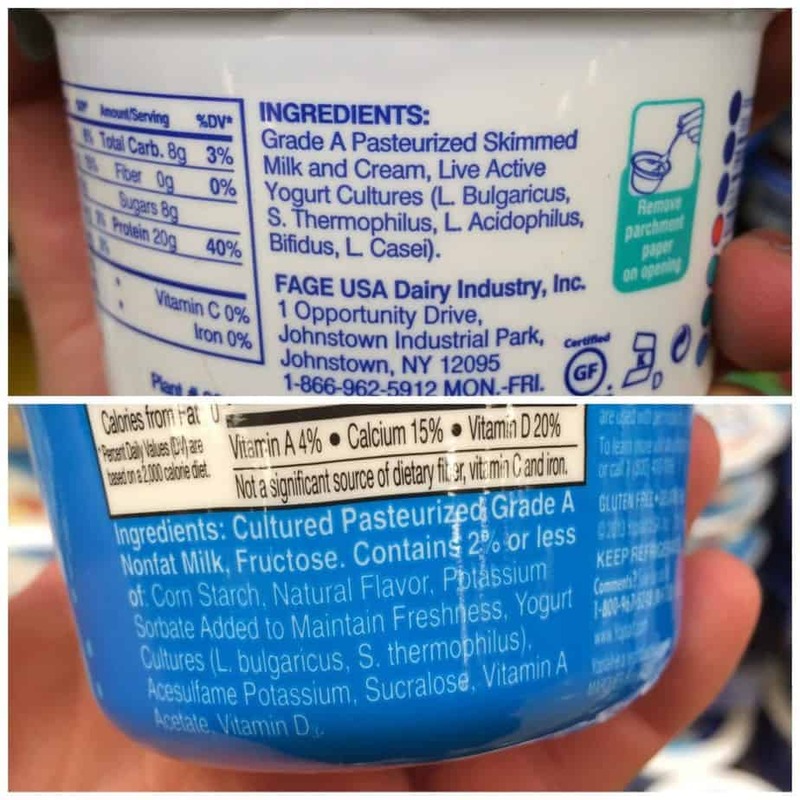 Lots of brands contain thickeners like pectin and corn starch along with artificial sweeteners like sucralose. Some even contain whey protein in order to boost the protein content on the label. We want strained yogurt that’s naturally high in protein, not full of added protein. That’s a no no. Ohhh buttah. Cutting fat and calories from a food that’s inherently all fat and calories means adding chemicals and flavorings to make up for it. Exhibit A. In order to slash calories by half, crap like modified food starch, monoglycerides and preservatives like sodium benzoate were added to the mix. 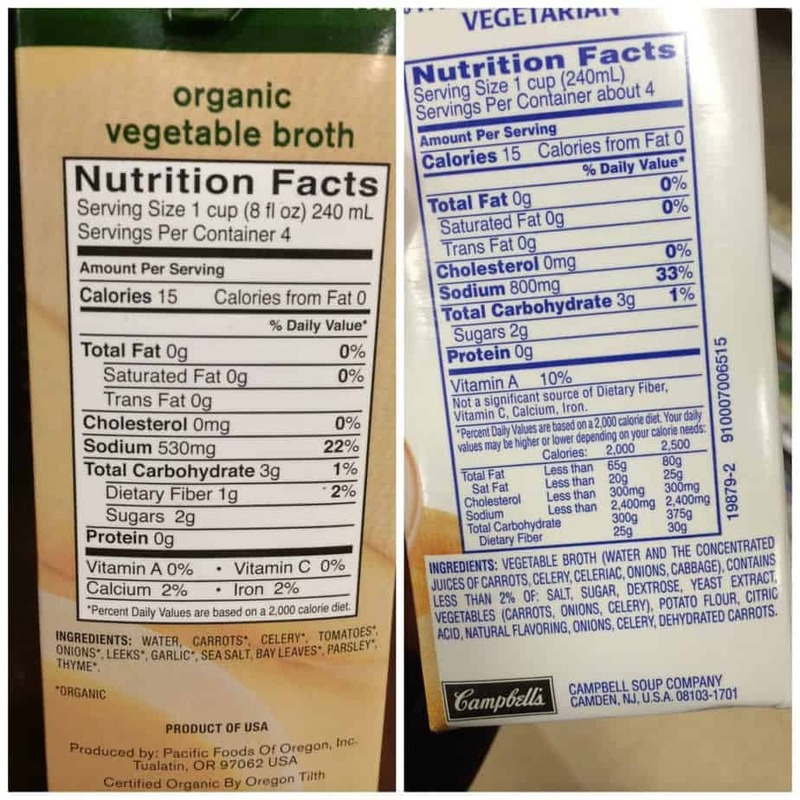 Vegetable broth is sneaky in that it often hides hidden sources of MSG, like yeast extract. Yeast extract contains free glutamate, the most active ingredient in MSG. Go for ones that are–welp, veggies and water. Pass on the dextrose, yeast extract and “natural flavors,” which is a code name for a list of hundreds of flavorings that aren’t required to be listed by name. The definition according to the Code of Federal Regulations is “the essential oil, oleoresin, essence or extractive, protein hydrolysate, distillate, or any product of roasting, heating or enzymolysis, which contains the flavoring constituents derived from a spice, fruit or fruit juice, vegetable or vegetable juice, edible yeast, herb, bark, bud, root, leaf or similar plant material, meat, seafood, poultry, eggs, dairy products, or fermentation products thereof, whose significant function in food is flavoring rather than nutritional (21CFR101.22).” Natural? I think not. Everyone wants to stuff granola with protein these days. Avoid granola boasting “high protein” claims, since they’re likely amped up with soy protein isolate. Eating small amounts of organic soy in whole forms like tofu and tempeh is all fine and dandy. You don’t need it’s highly processed leftovers in your granola. Kapeesh? Go for one made with simple, wholesome ingredients like rolled oats, honey or maple syrup, nuts, seeds and dried fruit. Please tell me you don’t pollute your coffee with this liquid poison every morning. Okay….a bit hyperbolic, I’ll admit. Jacking up your java with partially hydrogenated oil (trans fat) and a bunch of artificial sweeteners? I couldn’t think of a worse way to start the day. Pass on the preservatives and fake flavorings and go for creamers made simply with milk and cream. Coffeemate even makes a natural version now! Oh la la. 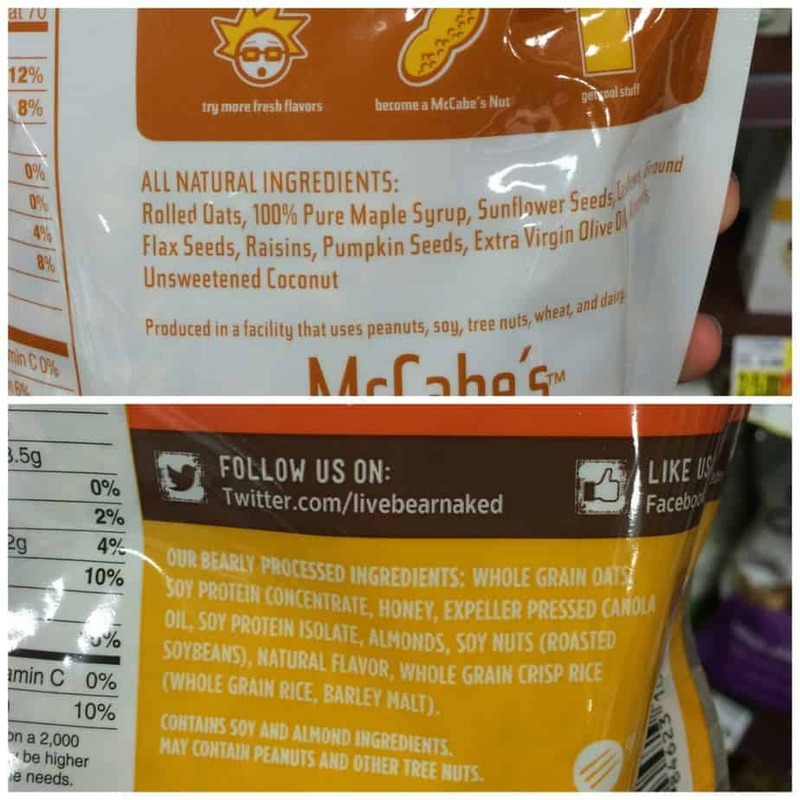 You’d think you could skip the label reading when it comes to a snack as simple as nuts…but these cocktail nuts are doused in hydrolyzed soy protein, maltodextrin, corn syrup solids and “natural” flavor. Stick with version that have only nuts as the ingredients (oil and salt are okay, too). Also, a word on popcorn. Must we pop our popcorn in trans fat? Not if I can help it! 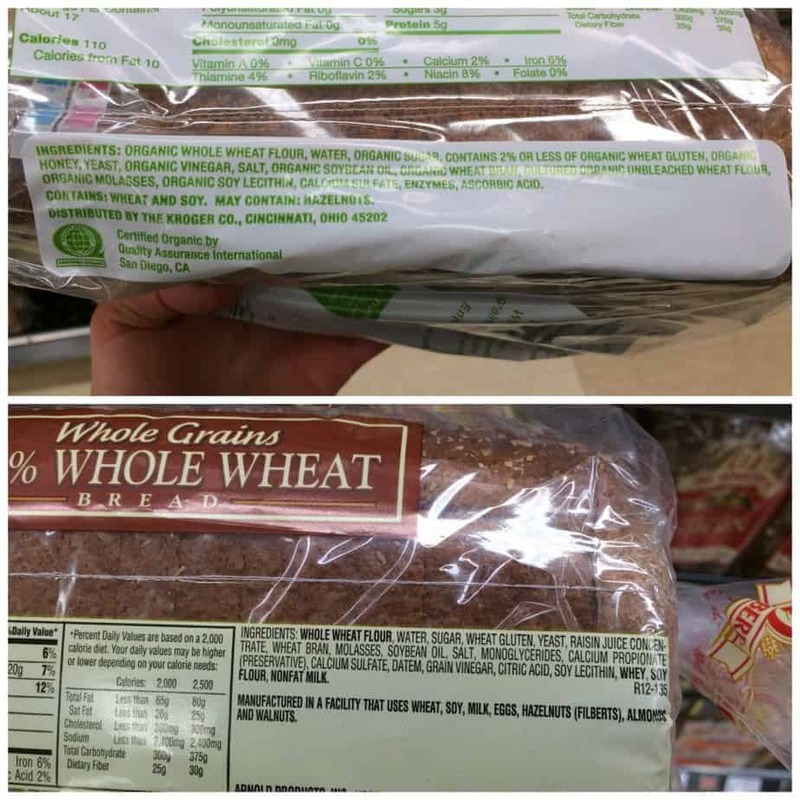 Read the label and make sure partially hydrogenated oil isn’t on the list. The tolerable upper limit for trans fat is zero grams. It’s directly correlated to heart disease risk. Say no! Ever wonder why “natural” peanut butters must be stirred? 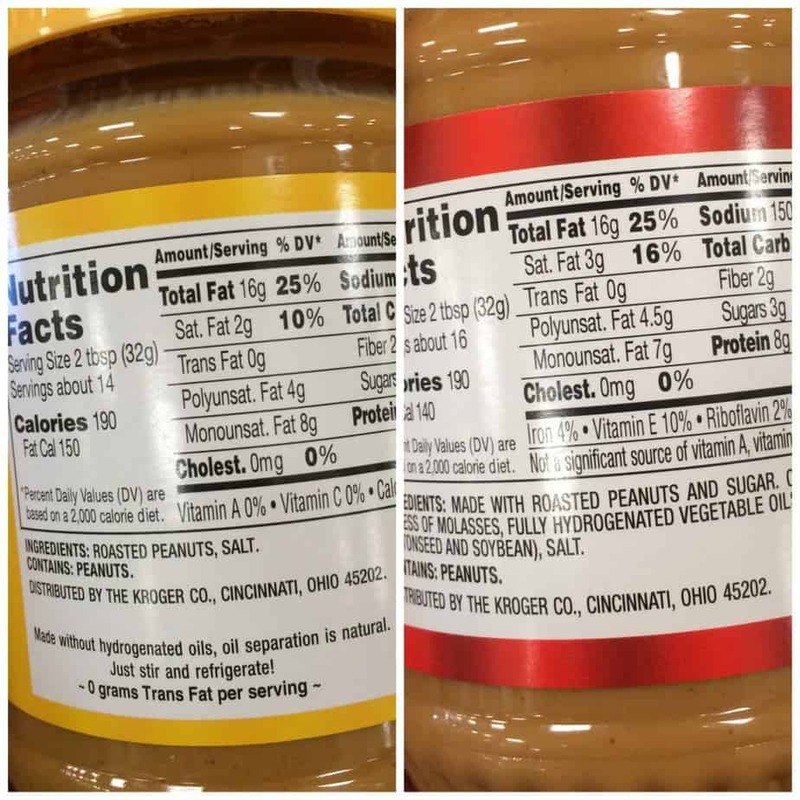 Traditional peanut butter is solidified with hydrogenated oils. Aim for the natural brands without trans fat. Peanut and salt are what we’re going for, here! The natural versions with palm oil are okay, too. This store brand natural version was under two dollars! When it comes to bread, you definitely want whole wheat flour as the first ingredient. Go for versions with shorter ingredient lists and ones without high fructose corn syrup, enriched wheat flour (white flour), datem and calcium propionate. Old fashioned oats (or better yet, steel cut) are less processed than instant, but sometimes we’re in a hurry and I get that. Lots of mainstream brands like Quaker have artificial sweeteners. As always, look for a wholesome ingredient list without added crap! It shouldn’t have more than four or five ingredients. 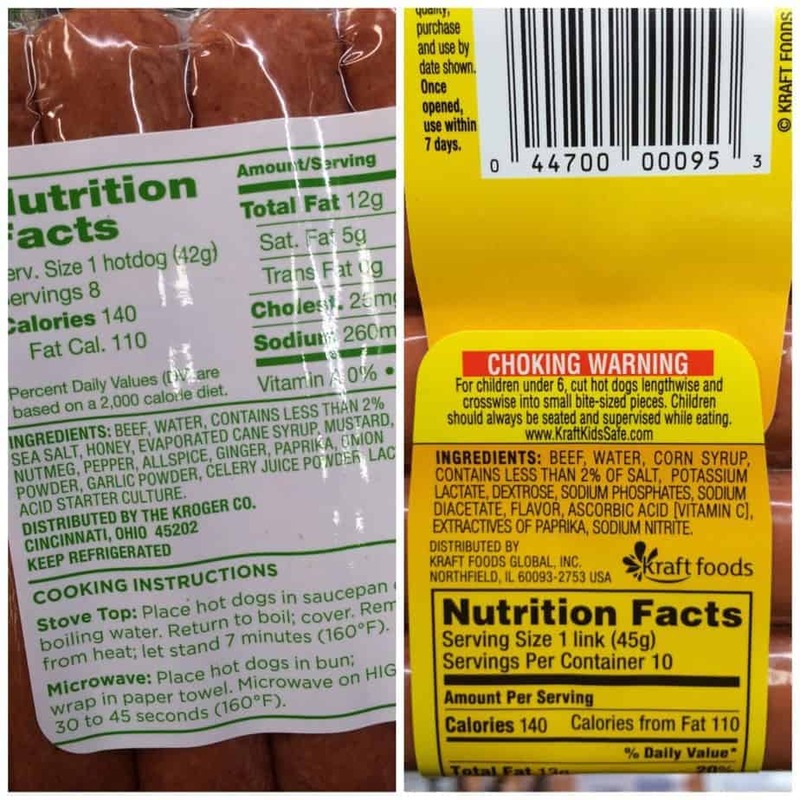 Processed meats get such a bad rep in the health field not only because of their exorbitantly high sodium content , but mostly because of the carcinogenic nitrates they contain. If you’re craving a hot dog, look for ones without those nasties. You wouldn’t believe the places that trans fat hides. You’ll find it in some taco shells, Lawry’s garlic salt, and even cocktail nuts! What’s the message here? Read the ingredient label! Eating clean is a dirty business, but reading ingredient lists makes the detective work a heck of a lot easier. Happy shopping! Muhaha. Questions? Comments? I’d be happy to answer them in a follow-up post, so leave one if you’ve got one! Eat foods with ingredients lists shorter than your hair? That doesn’t leave much out you silly legume. Jokes aside, you hit the nail on the head. Seriously, why is everything loaded with added protein and fiber? Eat a steak for protein eat an apple for fiber and all will be well. No joke, some of our packaged apple slices here have 4-5 ingredients. for APPLES. Hmmm I guess my hair IS pretty long. Bad comparison on my part! Steak and apples is all your really need in life. Your five ingredient apples sound like all kinds of cray! That’s awesome that your allergies had you reading ingredients as a little tot! Food vs. non-food is harder than it seems. Loading up on chemicals to combat calories is most definitely not the answer. Great comment, lady! Yup, took me 65 years to get it right. Now am vigilant about what I eat and am enjoying all the health benefits of a healthy lifestyle. Good for you, Jackie! Better late than never, right? It’s never too late to find your healthy self. This is such a great way to show that calories should NOT be the only thing we read on labels! Your pictures are totally informative, and I definitely agree that the less ingredients, the BETTER. Clean eating is based on what’s more natural! Thanks so much for this post – reading labels is so underrated nowadays. I’m glad the pictures helped! 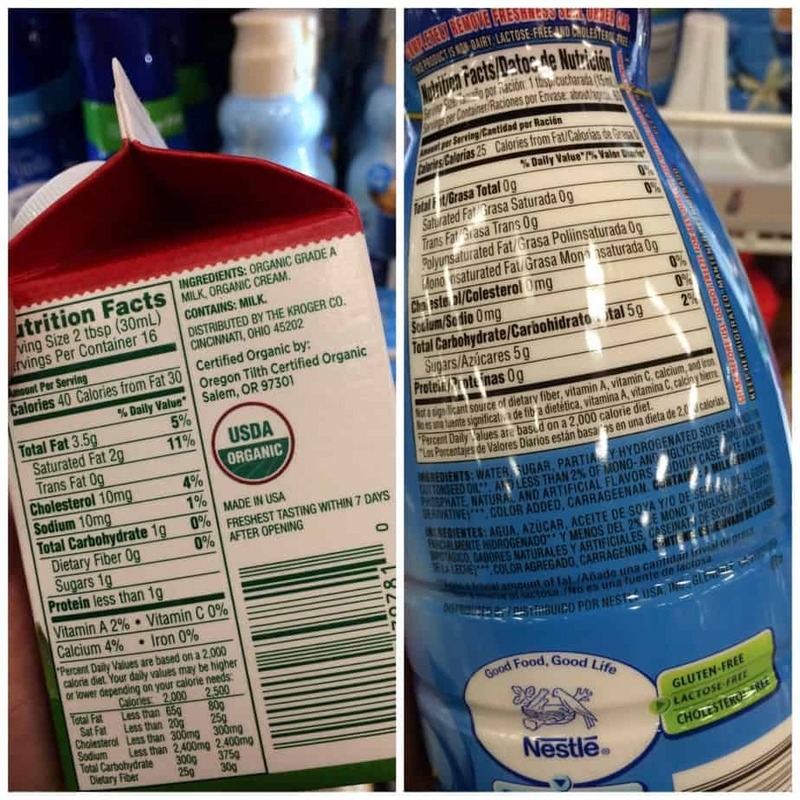 Reading it is one thing, but seeing an actual label comparison is another story! This is an AWESOME lesson, but something that I really struggle with getting people to understand. So many folks are SO totally caught up in the calorie content. My mom still believes fat free foods are the way to go. Fat free candy. Fat free cookies. All better than you than anything else because they are fat free!! It’s just a mindset that people are stuck in, and I wish more people understood that it isn’t always about the calories but instead about the nutrients and what they can do for you! Fat free cookies…don’t even get me started! We live in a world of convenience food and no one is taught how to eat healthy, so it’s really up to us! Since so many people aren’t interested in the first place, we’ve got quite a challenge. Thanks for the comment! There has been no greater lesson in living healthfully for me than eating whole, real foods and checking ingredient lists. When I think about some of the things I used to eat as a kid because I didn’t really have much of a say or much knowledge about it, it makes me kind of angry. I’m going to definitely be one of those annoying parents when I get older who won’t let their kid eat pop tarts and boxed cereal on the reg. And they will never know anything other than natural nut butter. That’s one of my biggest pet peeves, actually, adding fats into nut butter. Ugh. Such a great post Alexis and SO true! 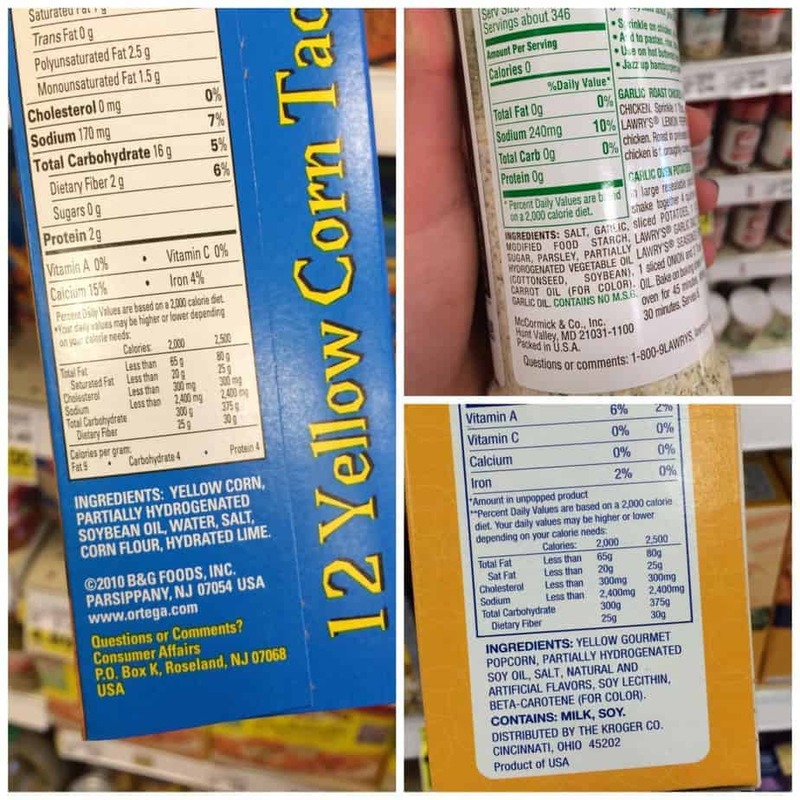 Ever since I started getting serious about my health and what food I put into my body, I’ve been diligent about reading the ingredients labels on foods that I buy. My policy is, the shorter the ingredients list the better and I have to be able to pronounce ALL ingredients. There’s so much hidden stuff in our food – it’s kind of scary, so it’s definitely important to scrutinize everything. This was probably my favourite post of yours that you’ve written. You preach exactly how I eat. Yes, you’ll find me reading nutrition labels and no not for the calories. I want to know exactly what is in my food…otherwise I might as well drink bleach. And I’ve definitely grabbed a disgusting granola bar out of my father’s hands and read the ingredients to him. The only downside to this is that he will only eat homemade granola bars and I can’t keep up with his consumption! I kind of want to email this post to all of my friends! Sharing it on Kewaza to start! All I can say to this is LOVE! I totally used to fall for the lower calorie trick…now I am all about reading the label and finding the most whole and natural product- even if it means it contains more calories! Thanks Hannah!! I’m so glad you’re out of the calorie realm. We all fall into that trap at one point or another! Love this post. A whole lot. Definitely one of my faves on your blog to date. Really helpful! I don’t think I blinked reading the entire thing. So good, so relevant, so simple. You rock and I will pretend you are with me on my next grocery store run! WAHOOOOOO! Bahaha no blinking allowed. I’m fairly new to your blog, and I must say that this is the best post I have read in a while! Totally agree! AWESOME POST. I am insufferable to go to the store with because I look at every ingredient and if I don’t know what it is and where exactly it came from, I put it right back down. I can’t even say how much I resonate with this post because I agree with exactly everything you’re saying. People who eat yogurt full of added sugars and JIF peanut butter and all of that stuff they think are healthy give me such anxiety. Good for you!! I’m so glad you agree :) Real food lovers unite! All kidding aside, I have been working on getting my daughter to read labels instead of just grabbing something deemed healthy – now I am gonna have to show her your post! Great post. I definitely learned a few things. It’s nice to know that I’m not the only one that spends time reading the labels. It’s incredible what is passed as acceptable ingredients in our food. It can be very hard to understand what some of them even mean. Thanks for sharing the knowledge. You’re welcome! It’s a tricky business and the food companies make it quite challenging. Let’s put all that fake crap out of business!!!! I’m down. Yes, yes, yes to everything you said. If I’m going to eat something sweet, the sugar in it is gonna be real. I was discussing this with my co-worker the other day…. sugar is “bad for you” (in quotes because it’s a simplistic, generalized statement) and fake sugar is “bad for you.” So just avoid the chemicals and eat the real stuff in moderation. Love your comment! I’m all about avoiding chemicals and eating the real stuff in moderation! Such a great post!! Reading ingredient labels are so key! I’ve been surprised a time or two when I picked up a product I thought was healthy and it certainly wasn’t. I couldn’t agree with you more when it comes to quality over quantity in terms of calories. I find if I fill my body with whole, real foods, there’s no need to count calories. Isn’t that such a bummer? Most products that advertise as being healthy aren’t healthy at all! It’s a crazy world out there. I definitely agree with this! Yes, yes, YES! There’s no need for products pumped up with added protein and fiber when you can easily get enough of both through real foods. 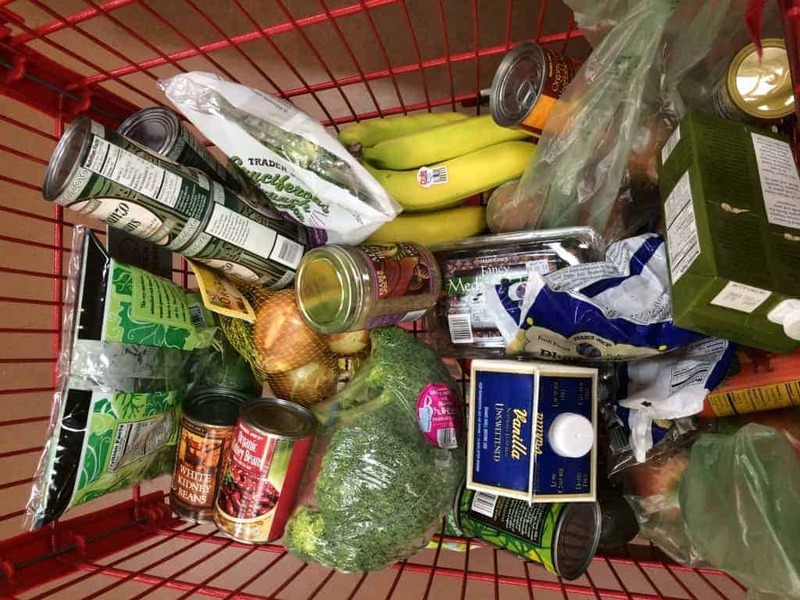 I always look at the ingredients list before anything else, and shopping at natural foods stores and being a vegan makes this even easier because the foods I eat are mostly from the produce section and the bulk bins–nothing weird added! I hate seeing people eating processed stuff they think is healthy just because it’s low calorie or low fat, but they have no idea what kind of ingredients they’re putting into their body. Being vegan definitely helps! Except for vegan Oreos ;) I know what you mean about seeing people eat processed stuff–sometimes I wanna yell out HOLD THAT FORK!! What a great post, thanks for sharing all of this helpful information! I see so many people at the grocery store always reaching for the “light” and “nonfat” version and I cringe inside. So much of this is due to education and lack of knowledge about what’s really hiding in our food these days. I’m hoping that more and more people will start reversing that mindset that “diet” foods are actually healthy for you! Thanks, Anna! Non-fat is totes cringe-worthy :) It’s up to us to reverse the diet food trend! Such a great post! So many people struggle with understanding what it means to eat clean. I think it can be so mindblowing when someone is first told to look at the ingredients list instead of the nutrition facts. I am definitely going to refer my hospital patients to this post when they need a good, simple walk-through on clean eating! Thanks for sharing! NOOOO calorie counting for GiGi! I hate numbers, I am a words girl… Which is why I read INGREDIENTS! I find them to be FAR MORE important that the numbers on the label. THE FDA is brain washing us all, because the ingredients are 500x more important! This was super informative. Thanks! Great post! I agree with every word! Except I’m a little skeptical of palm oil . I stick to the au natural pb. I was horrified when I took a look at the bag of cheese puffs my Nana was eating when the label stated 1 gram of trans fat PER SERVING! You know it’s bad when there is an actual number where it says trans fat. Poin in case, stay away from neon orange snack foods. seriously eating clean is a really tough thing. sometimes i buy things just assuming its good only to find out its loaded with so much crap :( thanks for the reminder esp with bread. I dont even know which ones to buy.. I LOVE THIS POST. I almost got my degree in Dietetics and I’m so passionate about this stuff. And this was a really good reminder for me as well, because I tend to get lazy about food. Seriously though, love this and your blog. Thanks so much for your sweet comment, Michelle! Thank you so very much for this article and the great side-by-side pics. I have shared your article with my husband who drinks CoffeeMate every day (yikes!). I hope he will read it and make some changes. I especially appreciate the information about the bread. I find it hard to find healthy, soft, and good tasting bread. I’m glad you and your hubby liked the article! Hopefully he’ll make the switch now :) It’s definitely hard to find soft bread that’s not full of preservatives…Whole Foods makes a whole-wheat house brand bread that’s soft and not full of crap, too! Hey Rachel! Basically the problem lies in the harsh processing. Soy is a great complete protein for vegetarians, and consuming organic tofu, tempeh or soymilk a couple times a week is perfectly fine. But grinding, heating, and picking apart the soy (which is most likely genetically modified) until all that’s left is the processed isolated protein and then adding that to all kinds of foods to boost the protein content isn’t pretty. It just doesn’t mesh with the whole-foods lifestyle that I like to promote :) Hope that helps! What a great post! I do the exact same thing at the grocery store…probably why it take me 2 hours to shop every week! Thanks so much, Andrea! Grocery shopping is QUITE the event. No shame! I found this post through Running with Spoons link love, and I’m so glad I did. I’m a huge advocate of reading labels for their ingredients as opposed to calorie counts and other nutritional stats. Naturally then, I loved this post. I couldn’t have said it better myself. I also whole heartedly agree with food containing the nutrients they’re suppose to, without beefing them up with protein and fiber. I don’t get the obsession and since most Americans are overweight, it’s obviously not working. I wish, instead of having to diligent read labels, we could just exclude this crap from our food supply to begin with….hopefully one day. Alexis this was a really educational post, I’m sure it will help many. 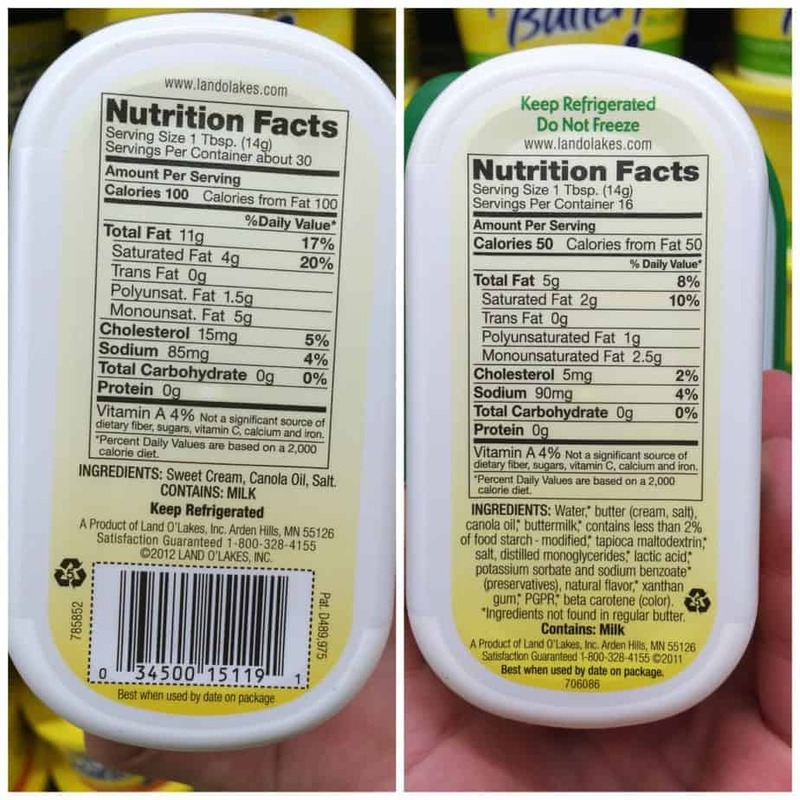 I haven’t seen the supposedly healthier butter with all the additional crazy ingredients (shaking head). It’s amazing what we will do to food in pursuit of the latest fad— the very latest, as you noted, being protein. Leave the food the way it came as much as possible! Thanks so much, Mary. I hope it was helpful! I love the last line of your post…that sums it up pretty perfectly! Hi! Just stumbled across your blog and I am loving it so far! So, I checked my greek yogurt (Stonyfield) and realized the vanilla flavor contains pectin, big bummer b/c I LOVE the vanilla flavor and usually add my own granola along with some fruit. I guess I’d better switch to the plain version (a bit tart for me!) or any ideas to add natural vanilla flavor? I use Bliss for my morning coffee and was happy to see you mention this in your post! Although maybe I will try plain cream for a bit less sugar in the morning. Great article! Another great bread option is Food For Life’s Ezekiel sprouted grains bread. Makes great toast and the ingredients are all organic plants! Organic Sprouted Wheat, Filtered Water, Organic Malted Barley, Organic Sprouted Rye, Organic Sprouted Barley, Organic Sprouted Oats, Organic Sprouted Millet, Organic Sprouted Corn, Organic Sprouted Brown Rice, Fresh Yeast, Organic Wheat Gluten, Sea Salt. fish like salmon, mackerel and sardines in addition to nuts, seeds and their oils. hello hello and thanks for the great post! I was wondering your thoughts on water flavoring methods? in particular crystal light or Mio that claim to have zero calories?